In southern India, the textile industry provides vital jobs and incomes to poor communities, but instances of abuses such as bonded labour are often found within the industry. 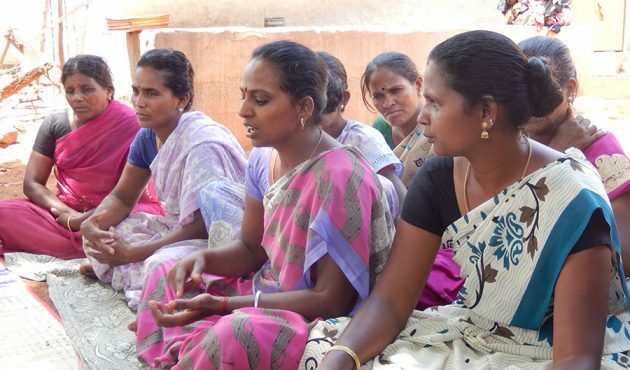 The Freedom Fund’s southern India hotspot helps reduce bonded labour in textiles, especially among girls and young women working in spinning mills and garment factories. Avarampatti village is one of 30 villages where Child Voice has set up adolescent girls groups and adult support groups. They have two main intentions: To help the adolescents get back to school, and to get improved conditions for workers at the local spinning mills. The adolescent girls groups in these villages currently have 840 members. Child Voice is one of 13 NGOs working in 405 villages who are doing similar work as part of the Freedom Fund’s hotspot program in Tamil Nadu. We met with 18 members of the adult support group in Avarampatti and they explained that they’ve been encouraging girls to go to school. One said “This is our village and our people. So we talk to the parents.” Although the group has helped 30 girls to either go back to studying or learn tailoring skills, they’re concerned that some adolescents are still going to the mill and they don’t think the conditions there are safe. The group members said that for the first 10 days when they were meeting the parents, they got a hostile reaction, but then the group mobilised funds to help the girls with basic school supplies. They said this helped the parents to be more open to talking to them. The adult group understands that to be able to keep girls in school, families need better incomes. With help from Child Voice, the group spoke to one of the main banks which is a channel for government-backed loans. The bank arranges training for adults and then gives them a shared low-interest loan to start new livelihoods. So far, 20 adults in the village have been helped to consider the feasibility of poultry and goat keeping, keeping milk cows, embroidery work, candle making and incense stick production. Once the adults have selected which training they think will work best, they will then get a longer training in that skill, and they will form a “Joint Liability Group” to take responsibility for the shared bank loan. The adult support group described what seems like a patchwork of solutions, that they hope will give girls better opportunities. For example, six young women have been referred for training as nursing assistants and ten more have been identified to do the same training. The nursing work will pay them at least 50 percent more than they can earn at the mills. The group is also trying to set up computer and English classes in the village. But the group also emphasised that the solution can’t only be about finding options other than the mills. The mills are an important source of employment, and they want to improve conditions, so it will be safe work at a proper wage. They have the idea of going as a larger group to talk to the management of the surrounding mills. The group has found that when they take action collectively they can often make progress, so they’re moving on to the more “intractable” problems. For example, they’re concerned about the water crisis in the area. The water is very hard, heavy with minerals, and year by year, the water shortages increase. Lack of water limits the other work available, and if people get sick, then girls are more likely to be sent for work in risky circumstances. To prove their point, they pass a glass of the water to my colleague who takes a cautious sip and shudders, hesitant to spit it out, reluctant to swallow it. Although the group has helped so many local families, the water shortage is one challenge they can’t yet figure out. Find out more about the Freedom Fund’s southern India hotspot.